In Puerto Rico, the cult of the so-called “Virgen de Monserrate” is concentrated in the town of Hormigueros, in the west of the island. Little is known about the history of the cult and the image of La Monserrate on the Caribbean island. 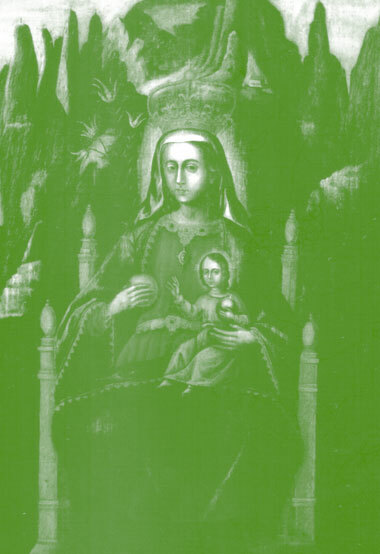 There are two main images of La Moreneta in Puerto Rico: a Romanic one depicting her as a black virgin, similar to the canonical image of Catalonia; and the other, later, depicting her as a white virgin with the mountains of Montserrat in the background (in this case, it would appear that the image of the Mother of God corresponds to that of the Virgin of Oriola, in Valencia, which syncretises with the original image). It is said that the first chapel to the virgin of Montserrate was built by a Catalan in 1560. 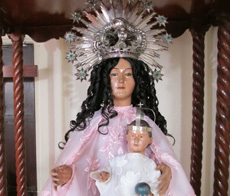 Different legends and miracles have been attributed to this virgin. The most well-known story relates that a peasant of supposedly Catalan origin found himself alone facing a bull who was about to charge at him, and asked the virgin for help. The latter appeared and miraculously stopped the beast. In Puerto Rico there are countless “wood statues” (tallas) reproducing this episode. 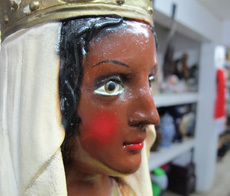 The image of the Virgin of Montserrat was reappropriated by the slaves liberated during the 17th and 18th centuries. Hereinafter she was also called “La Virgen Cimarrona”. Undoubtedly, the fact that she is a black virgin promotes this appropriation. 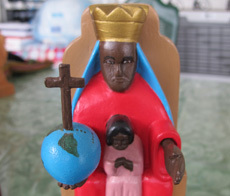 Today, this figure is present on many religious altars of what are known as the “Afro-American religions”, which are tremendously popular on the island, especially in the north and the west, where Hormigueros is located. The esoterical shops, known as “botánicas”, contain a version of the virgin depicted as a black woman with a white child on her lap.